The Douglas Celtic range features some genuine Scottish beers – as rugged as that country, as mysterious as its legends, and as generous as its inhabitants. It draws its name from a river in the province of Linnius in Scotland, which was the site of numerous epic battles in which King Arthur is said to have fought in the 5th century AD. The river’s name, ‘Dubglas’ or ‘Douglas’, means ‘black water’, and it was arguably these battles, fought against a coalition of Saxons, Scots and Picts, that represent the point of origin of the United Kingdom that we know today. Legend and history blur into each other. 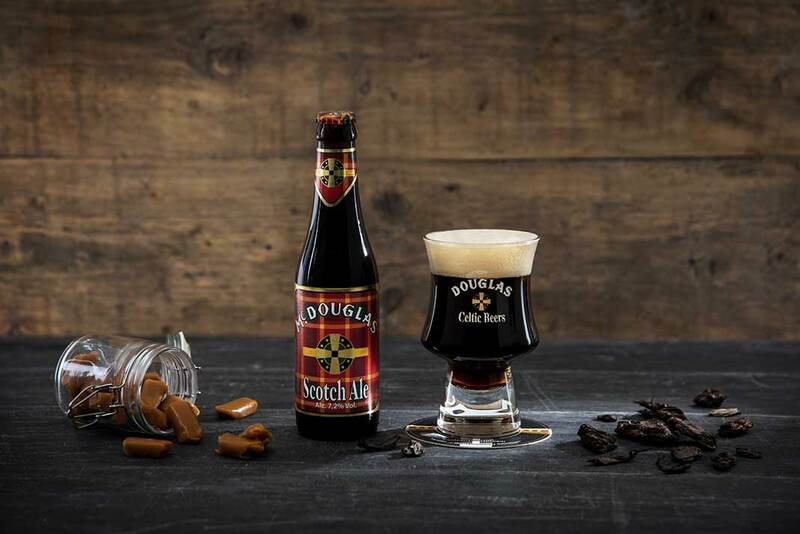 One thing is clear, though : the noble Douglas beers, sturdy of character, derive their name from these events and from the brave and doughty warriors who gave everything, including their own lives, for a fine ideal and a modern vision of the concept of nationhood ! The concept of chivalry may not be to everyone’s taste today, but the drinkers who lay siege to the bar perhaps have something of the high spirits and good humour of those men who, returning victorious, tasted the joys of the resting warrior. Let’s raise our glass in their honour !